Tracking bird movement and behavior at multiple scales in space and time is not an easy task. A team at the University of Amsterdam (UvA) has worked together to develop a flexible, state of the art, Bird Tracking System, the Uva-BiTS. ​The system includes a solar powered, light weight GPS tag with rechargeable batteries, a tri-axial accelerometer, two way data communication to a ground station network, automated data processing and visualization in the Virtual Lab. Researchers from multiple organizations are working with this system to study migration, navigation, foraging strategies on land and at sea. The system will continue to develop fostering research needs of a diverse community. 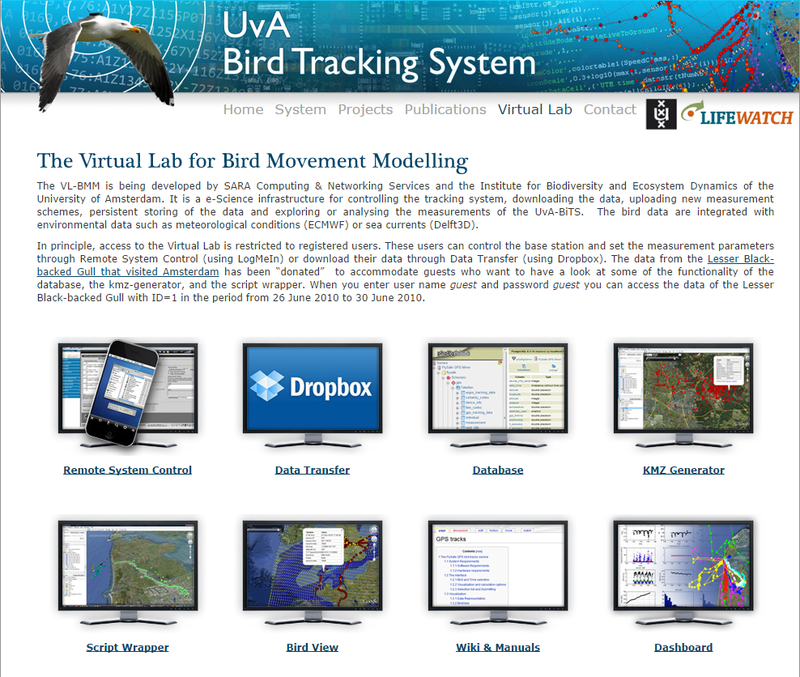 The Virtual Lab for Bird Movement Modelling (VL-BMM) is an e-Science infrastructure for controlling the tracking system, downloading the data, uploading new measurement schemes, persistent storing of the data and exploring or analyzing the measurements of the UvA-BiTS. The Virtual Lab for Bird Movement Modelling (VL-BMM) is being developed by SURFsara (previously SARA Computing & Networking Services) and the Institute for Biodiversity and Ecosystem Dynamics (IBED) of the University of Amsterdam. The bird GPS tracking data are integrated with environmental data such as meteorological conditions (ECMWF) or sea currents (Delf3D). Remote System Control: Registered users can control the base station and set the measurements parameters (using LogMeIn). Data Transfer: Registered users can download their data (using Dropbox). Database: Registered users can access their tracking data and metadata. KMZ Generator: Registered users can make a Google Earth visualization of their data. Script Wrapper: Registered users can make a general overview of their data, including tag performance, or can make a Google Earth visualization of their data. The data from the Lesser Black-backed Gull that visited Amsterdam has been "donated" to accommodate guests who want to have a look at some of the functionalities of the database, the KMZ generator, and the script wrapper. When you enter user name guest and password guest you can access the data of the Lesser Black-backed Gull with ID=1 in the period from 26 June 2010 to 30 June 2010. Information on the data model, data tables, fields, units, views and functions available in the database can be found on the FlySafe Wiki (user name and password are required). Several user manuals are available and open access. The data is stored in a postgreSQL database and access is provided through a phpPgAdmin web service.